Well, today is August 31st. Tomorrow is the start of September, the start of a new monthly charm and a new season. Expect the grass to start changing from vivid green to deathly brown. I’m not sure how fast the transformation is, but we’ll see soon enough. Well, as I wrote in my previous post, I had my gates open for a while last night. Since I’m super excited about the new Metroid Prime Trilogy that just came out, I decided to change Squirt’s outfit to the Samus costume. Plus it hides the fact that he’s all pale once again. That tan did NOT last. I feel like in WW the tan at least lasted a little longer. Or maybe I just ruined it by playing only at night for the past week. Ahh well. Herito and Vella came over while the gate was open! I was very excited because Herito brought me some fruit for me to replant my town. He even brought one flower to complete the Shaolin Monthly Charm. And when the mail came, I found 4 pieces of fruit sent by Vella! So Shaolin will hopefully be regrowing at a faster rate now. And hopefully I won’t kill all my grass in the process. I must remember that the grass dies a LOT faster in the fall, so be careful everybody! Vella had never been to the top of the Lighthouse before. It took a bit of practice but eventually we all got up there! But there’s some stuff to look forward to, coming up in the not-too-distant-future! Specifically for Squirt in Shaolin, he only needs to catch the King Salmon to complete his fish encyclopedia. And he only needs the Bell Cricket and Red Dragonfly to finish the bug version. So expect to see Tortimer handing out Golden Tools to Squirt fairly soon! Labor Day: First Monday in September. 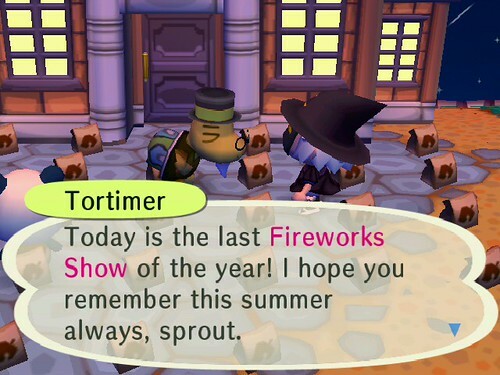 Receive a Picnic Basket from Tortimer! 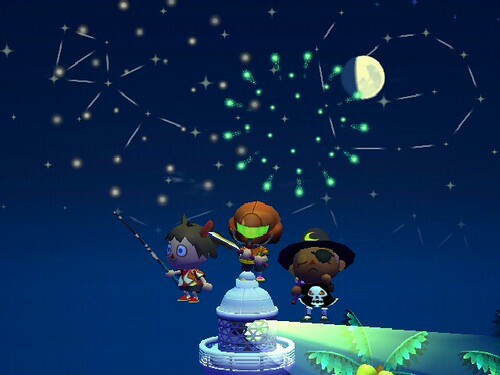 USA DLC: September 15th is slated to be the next released DLC, which celebrates the anniversary of the original release of Animal Crossing: GC! Final Bug-Off: September 19th is the last bug tournament of the year. This is my last chance to beat Vella’s top score of 118! What’s your top score? Flea Market: At the end of the month, on the 27th, is the Flea Market. Why wasn’t there one in August? Weird. So what does happen when you save while on the lighthouse? I guess I’ll just have to come over again and find out. I’ll have to try and beat my own 118 for the bug off, but I somehow doubt I will. All the good bugs are out at night and I play mostly in the morning—which is why I still have the tan I think. I actually check your door on the last August sunday night. I guess I am too late, it’s about 11p-12a CT. I even have my pockets full of the sparkles. Bummer!